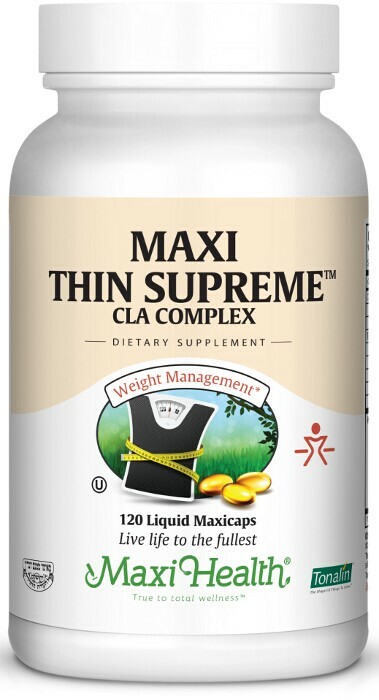 Maxi Thin Supreme™ is a blend of essential fatty acids.. It’s a unique combination of Tonalin® CLA, borage oil (providing GLA), coconut oil, flaxseed oil and -evening primrose oil the ingredients sought after by dieters and body builders. We at Maxi Health use TONALIN® CLA (conjugated linoleic acid), the highest quality form of CLA available. It is made from a proprietary process that converts linoleic acid from safflower into CLA. Safflower is the best source of linoleic acid, it contains no stimulants of any kind, natural or artificial. We have combined CLA with GLA. GLA is gamma linolenic acid, a main component of Borage, Evening Primrose and Flaxseed oils. Flax seed Oil’s is an Omega 3, you get its benefits too. Take six (6) Maxicaps­™ daily, two (2) before each meal, or as directed. For best results, take with D&S Support™. Other Ingredients: Vegetable cellulose, vegetable wax, titanium dioxide, d-alpha tocopheryl acetate. • This product contains no animal products, soy, wheat, gluten, yeast, salt, sugar, milk, corn, artificial flavors, colorings or preservatives. • Tonalin® CLA is a registered trademark of Cognis Corporation. I am 10 years old and trying to lose weight. I was always hungry and looking for nosh. I started taking Maxi thin supreme and D & S Support a few minutes before each meal. Now I can't even finish my plate of food. I also take Naturemax Plus every morning. So far I feel like it is working and controlling my appetite. Thank you so much.